Creamy Parmesan Chicken is a total hit for dinner, and easy to make. 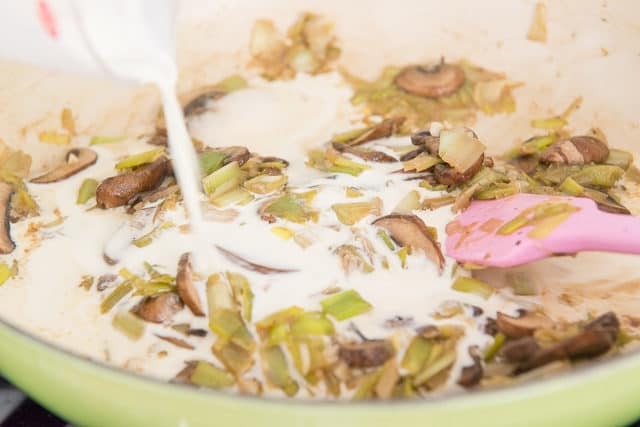 Bone-in, skin-on thighs are seared until golden and crispy, then cooked in a parmesan cream sauce with sauteed baby bella mushrooms and leeks. I’m pretty sure I’ll always favor white meat over dark when it comes to chicken, but lately I’ve been on a chicken thigh kick. Specifically the bone-in, skin-on cut. (Not sure why, but I don’t love the boneless, skinless thighs. Maybe because the bone makes the chicken so juicy, and crispy chicken skin is always wonderful, so how could you take those away)? Chicken thighs are one of the easiest cuts of meat you can cook. First of all, searing the skin makes for a delicious and beautiful presentation of the actual meat, but the searing also leaves brown flavor bits on the bottom of the pan, which you can incorporate into whatever sauce you add afterward. Thighs are also very forgiving when it comes to temperature. There’s a wider range where they’ll stay moist and delicious, than say, chicken breast or wings. This is a recipe that I’ve been making quite a bit over the past couple months, and I can’t get enough of it. I know, those sound like totally cliche words, but it’s TRUE! It’s one of those recipes where the final dish is so much more than the sum of its parts. In other words, the ingredient list is relatively simple, but the flavor is off the charts. Let me show you how to make it! I’ve got a video, and step-by-step photos below. Start by partially cooking some bone-in, skin-on chicken thighs. Season those with a pinch of salt and pepper. Bake the chicken for 20 minutes to finish cooking the chicken, and at that point, the skin should be golden and the sauce will be bubbling. Serve this Creamy Parmesan Chicken with a side of Potato Gratin for a really hearty dinner. 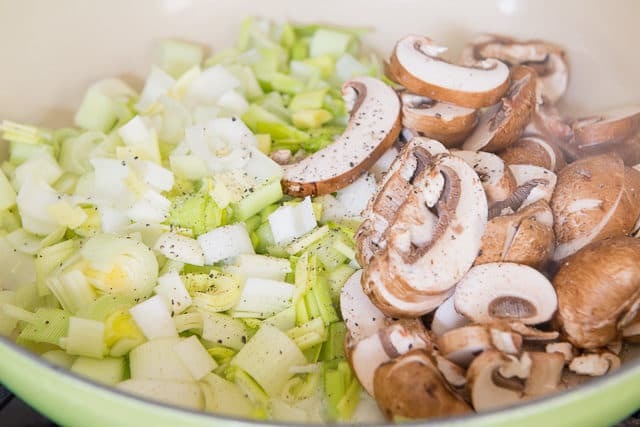 Or for something lighter, serve a salad like Warm Brussel Sprout Salad with Goat Cheese, Shredded Zucchini and Arugula Salad, or Caesar Salad with Parmesan Peppercorn Croutons. For more chicken thigh recipes, I really love Crispy Spiced Rubbed Chicken Thighs and Sticky Honey Lime Chicken Thighs. Enjoy! 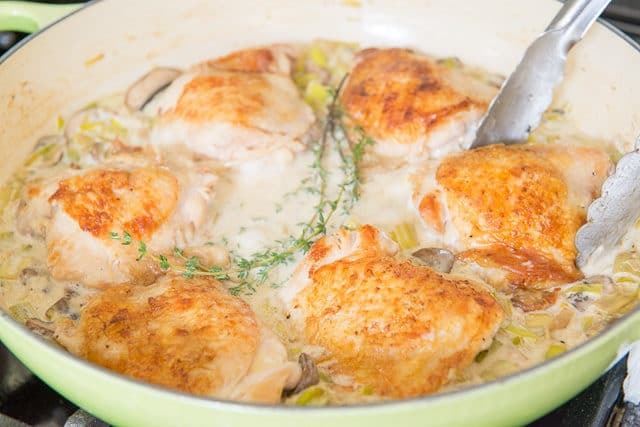 Creamy Parmesan Chicken Thighs with Mushrooms and Leeks is a total hit for dinner. 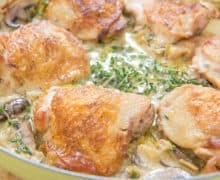 Chicken thighs are seared until golden and crispy, then cooked in a parmesan cream sauce with sauteed baby bella mushrooms and leeks. Season the chicken with a pinch of salt and pepper, on both sides. Heat a large skillet over medium heat, and add the olive oil. 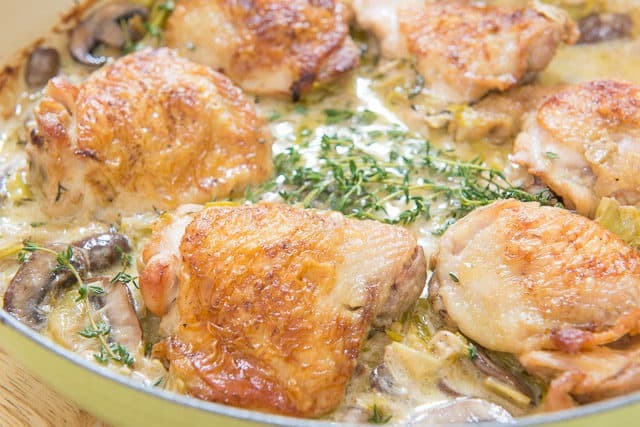 Place the chicken thighs in the pan skin-down, and cook for 5 minutes, until golden and crispy. 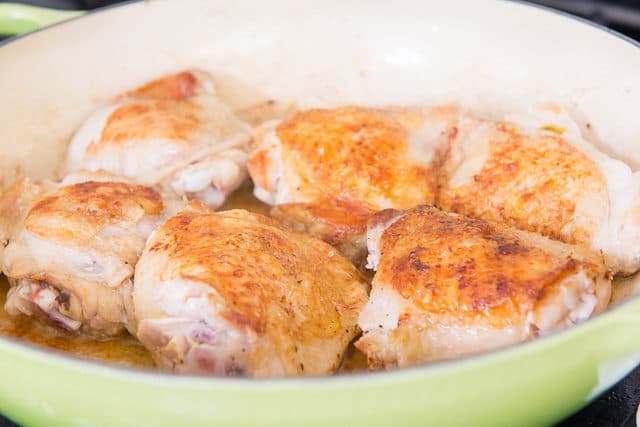 Flip the chicken and cook for 2 more minutes, then remove the chicken to a plate. 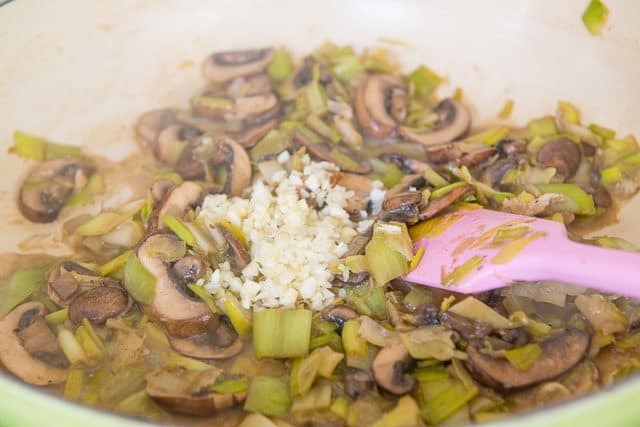 Melt the butter*, then add the leeks and mushrooms. Season with ½ tsp salt and ¼ tsp pepper, and cook for 10 minutes, until softened. 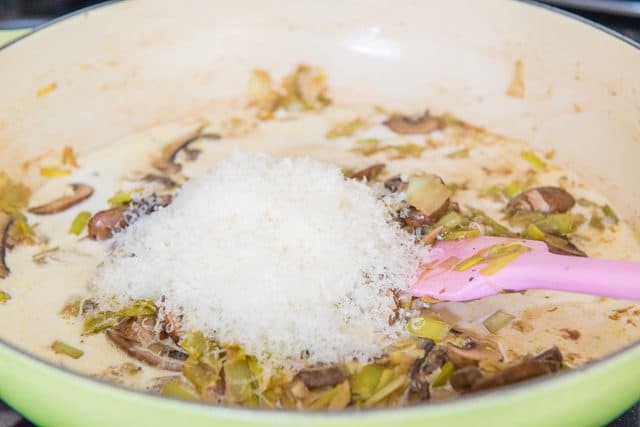 Add the cream and parmesan, and stir. Add the chicken back to the pan, along with any juices from the plate. 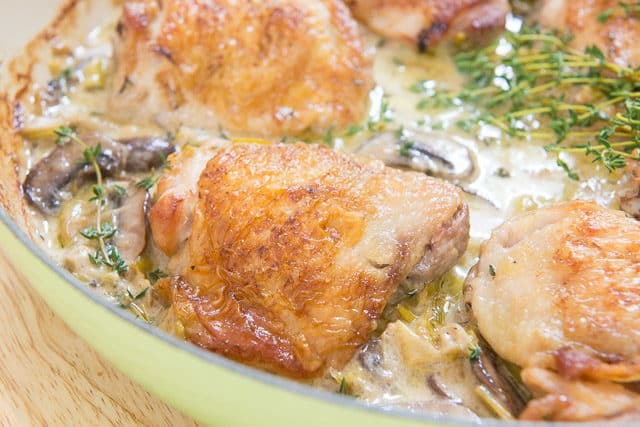 Add the thyme sprigs to the cream, then bake the chicken in the oven for 20 minutes, or until the chicken is completely cooked and measures 180F. Enjoy! *You may use olive oil instead. This looks wonderful, Joanne! I am going to be that person who asks, can you substitute smallish bone-in skin-on chicken breasts? Hi Mary Ellen, if they’re small enough, that would likely work, and it sounds like you likely know how to cook those (to 165). Even better though might be to do chicken cutlets for this! You wouldn’t have to bake it, but just simmer them in the sauce. Made this for the whole family and everyone loved it. Served some roasted potatoes with it. It was a hit! Thank you for sharing your delicious recipe Joanne. I used it more for inspiration rather than follow it precisely, but the result was still great. I didn’t have garlic, fresh thyme or parmesan and although I love olives, I don’t like the flavour of olive oil. Also, my hob went “bang” a few weeks ago and I’ve yet to replace it, so I’m currently restricted to cooking in my fan and microwave (MW) ovens. I love using my MW for almost everything that doesn’t need to be grilled or roasted, as it’s so quick and efficient; plus I think that quickly steaming vegetables in minimal or no added water in the MW is much better at preserving their flavours and nutrients than boiling them in a pot, unless one intends to used the water afterwards for a stock or as the base of a smoothie ! 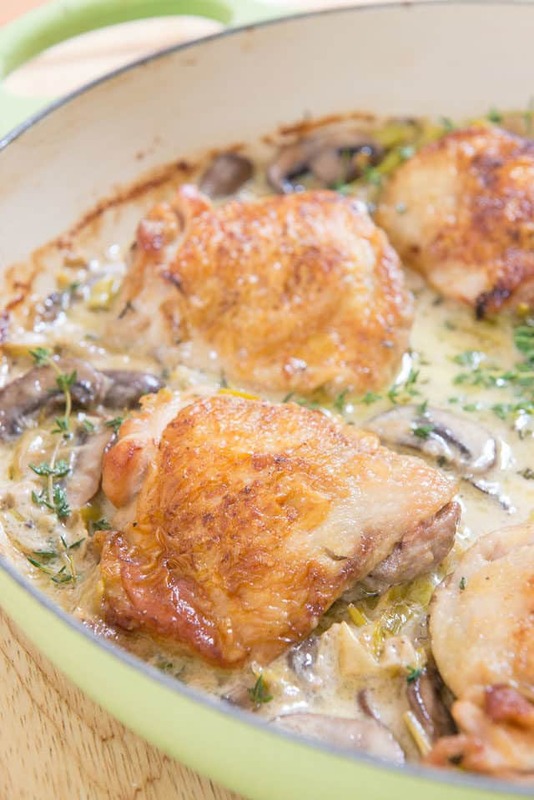 So anyway Joanne, I cooked the whole dish by MW, substituting dried herbes de Provence for the bunch of fresh thyme, strong mature English cheddar for the parmesan, and chicken dripping for the olive oil to soften the leeks and chestnut mushrooms (as we call Baby Bella in the UK). I wish now that I had added some onion to replace the missing garlic, but it didn’t occur to me while doing the cooking. Oh, and the chicken I used was the leftover thighs of a bird I had roasted the day before, plus a few other scraps of meat from the carcase that I wanted to use up. From the above description, or if I sent you a photo of my creation, I daresay you would think that I didn’t really follow your recipe at all and shouldn’t be commenting on how wonderful it is, but as I have said: it was your dish (especially the fabulous pictures) that made me have a go with what I had to hand, and so I am definitely giving your recipe five big stars! With love & thanks from Neal in Kent, UK. Hi Neal, I enjoyed your comment and I think your recipe sounds delicious! I think cooking with what you have is great too. Also I had no idea you call Baby bella mushrooms “chestnut mushrooms” in the UK, how fun. PS I’m jealous you live in the UK. MAN do I love that place! Happy cooking!